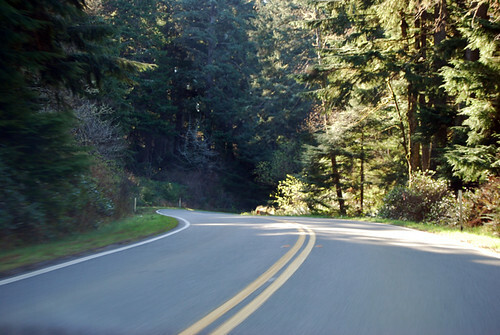 On Saturday, March 6, 2010, I drove Washington State Route 100, around in circles down near Ilwaco and the southwesternmost point in Washington. 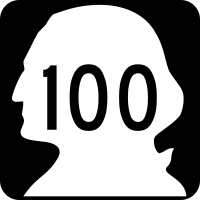 Triple digits, hooray! 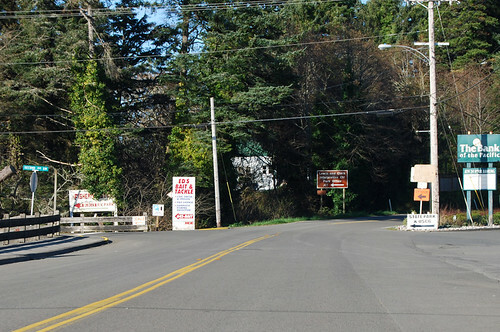 At the heart of the old town of Ilwaco, US 101 turns north and we go straight. SR 100 begins thusly. 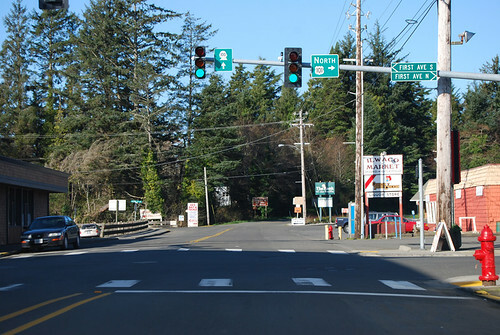 A block later, we find the first junction of SR 100 with itself. I got a bit freaked out by that detour sign. 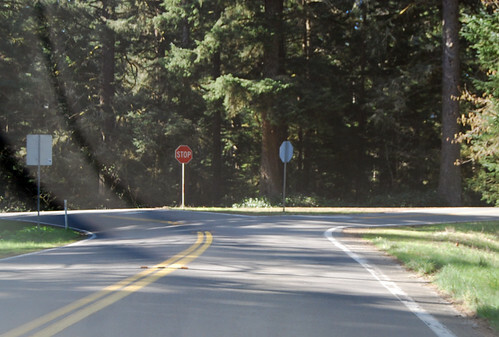 I hadn't seen any road work for this road on WSDOT's website, but here was a sign saying that I shouldn't proceed straight; I wouldn't be able to get to Fort Canby. I wouldn't be able to drive SR 100; I'd have to come back another time! But it turned out to be some construction of a viewpoint, but the workers were home for the weekend. Up and down and left and right; this is not a high-speed highway. And then SR 100 turns south and intersects itself again. 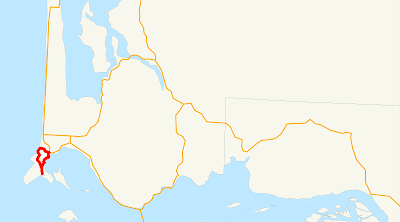 WSDOT signs it as Loop 100 with a spur, but the code describes 100 as two routes going the same direction. Thus I continued south on the spur instead of following the loop. 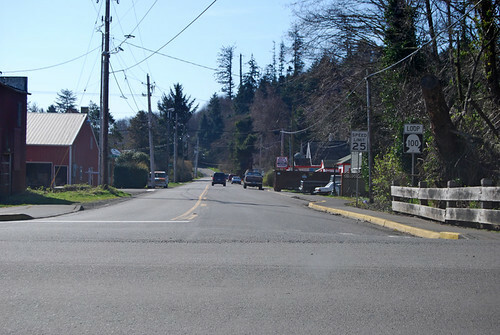 400' later, more or less, we arrive at the old boundary of Fort Canby State Park, and thus the end of SR 100. The park was expanded northward a while back -- and renamed Cape Disappointment State Park -- so we'd been in the state park for most of this little trip, but here's the end of the state highway officially. Even still, we drove all the way to the end of the pavement, down by the lighthouse. And suddenly we're back in Ilwaco on 2nd Avenue, heading south again over and around hills, with views out to the Columbia River and Oregon beyond. And once again at the southern of SR 100's two intersection with itself, we have thus completed our drive of SR 100. 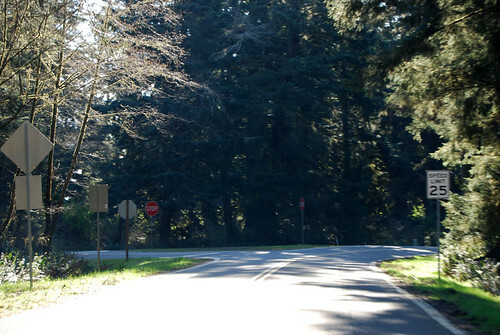 A fun little road in the corner of our state; always a nice place to drive. Take a walk out on the jetty, next time you're there.